Allan Sharkey, of Artistic Kitchens and Baths, recently started a new green energy company with his son, Joe. Originally, they had their website designed by someone else, but they weren't satisfied with the design. Since the site was already created, though, it made it very easy for me to see what kind of content they had on the site and how a new design could better match the company's promotional materials, such as fliers and business cards. 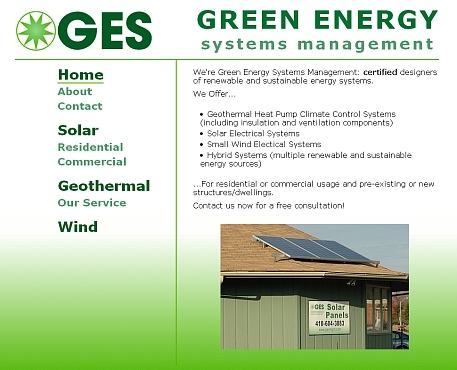 The business card for GESM has the same white to green gradient that I incorporated into the website design. The design I came up with accords with the business in other ways as well: the formatting of the company name, the font style, etc. This website is also the first time I've made use of fixed CSS elements. The company logo and the menu stay in a fixed position as the content box on the right moves. The main benefit of this is to allow the website user access to the menu at all times. When I presented the design to Allan, he agreed that it was a significant improvement over the previous design and was completely satisfied with it.